2 fixed rubber wheels and 2 swivel nylon castors. Handrails on both sides of steps. Platform W x D: 762 x 1600mm. Choice of 8 heights and two colours. Platform opening to left or right of steps (when ascending). Keeping your stock stored on high shelving is an efficient way to keep them secure and accessible; however, sometimes it can be a struggle getting them down again quickly and safely. 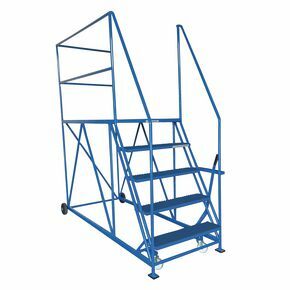 Our single ended access platforms offer a way to get your stock down from high shelving with ease. They are available in a choice of heights from 762mm to 2540mm and they come in either orange or blue. They have a hand rail up both sides of the stairs, giving an extra security level for the user, one is a full-length rail to/around the top and the access opening can be on the left or the right of the platform. Mounted on two fixed and two swivel castors allows you to move the steps without hassle, with a hand lever that immobilises the product for extra security whilst in use by staff. NB: The optimum operator working height is 1.5m above the platform, please double check the required height when ordering the correct size as these units are made to order and are non-refundable. Our single ended access platforms are useful and reliable products; they have a 24 month guarantee and FREE UK Delivery.